The Fine Arts Program is offered at Open Roads Public School in Dryden (807) 223-4418. 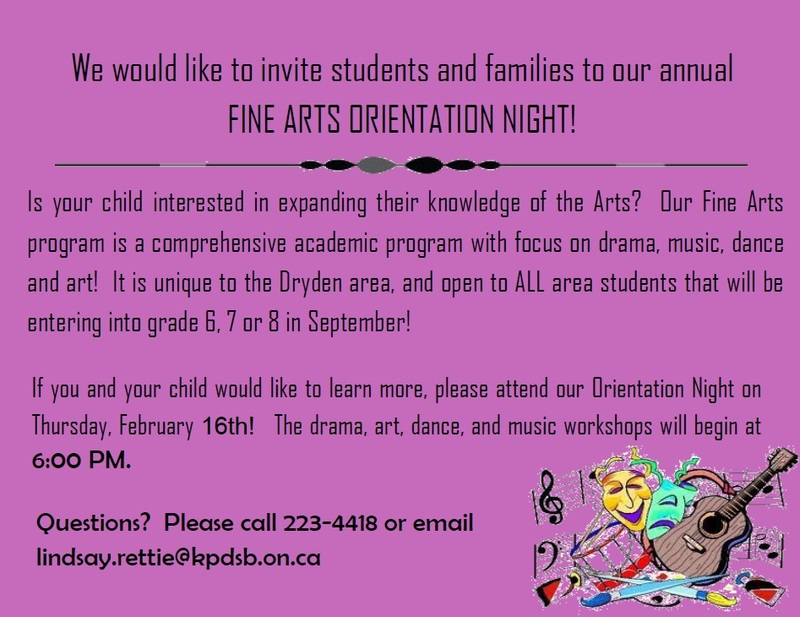 Join us on Thursday, March 21, 2019, at 6:00 for a Fine Arts Orientation Night. Click here to view our Fine Arts brochure. The Fine Arts Program is available for students in grades 6, 7 and 8. A modified timetable allows students to explore an increased focus on instrumental music, visual arts, drama and dance in addition to the regular curriculum. One-third of your child’s day will be dedicated to the study of arts education. Fine Arts students have three music classes a week, during which they learn to play brass, woodwind or percussion instruments. Students learn a variety of musical selections, which they present in school assemblies as well as public and community performances. Students also have opportunities to take part in available music workshops and attend musical performances. Fine Arts students actively participate in creative lessons that introduce various dramatic techniques. Students will have opportunities for weekly presentations and feedback and may also participate in major theatre productions. Field trips to professional theatrical venues and workshop opportunities with dancers and actors are also provided as program enrichment. Fine Arts students spend three classes per week in studio activities that include drawing, painting, experimenting with various media, art history, three-dimensional creations, planning and layout of projects, sketchbook development, display considerations and critique. Opportunities are provided for field trips to art galleries in the region and student work is often displayed in art shows both within the school and community.